AFG vs BAN 3rd T20I, How to watch Live Cricket Match Live on G TV, 1 TV, BTV, OSN Sports Cricket HD and streaming online from Dehradun. Get today's live cricket score and live updates on IndiaTV Sports. AFG vs BAN 3rd T20I, Watch Live Cricket Match on G TV Live: Afghanistan managed to post 145/6 on the board after they won the toss and elected to bat. But it is not the batting that has the attention, but the bowlers who come out to bowl as the spinner make their way and will make to whitewash the series as they have already won the first two by ease. Here you can get all the information related to when, where and how to watch the second T20I between Afghanistan and Bangladesh at the Rajiv Gandhi International Cricket Stadium, Dehradun, Uttarakhand. In Bangladesh, you can watch the live cricket on G TV, OSN sports cricket, G TV Live Cricket Match, Bangladesh vs Afghanistan T20 match, Match updates, AFG vs BAN live cricket scores, BAN vs AFG live cricket updates, recent cricket scores. You can get all the information here as to where you can watch the match on TV such as Bangladesh vs Afghanistan 2018 live stream, watch Afghanistan vs Bangladesh live streaming, Gazi tv live streaming, osn sports live streaming, Gazi tv live online cricket, gtv live streaming online, Bangladesh vs Afghanistan live streaming watch online. 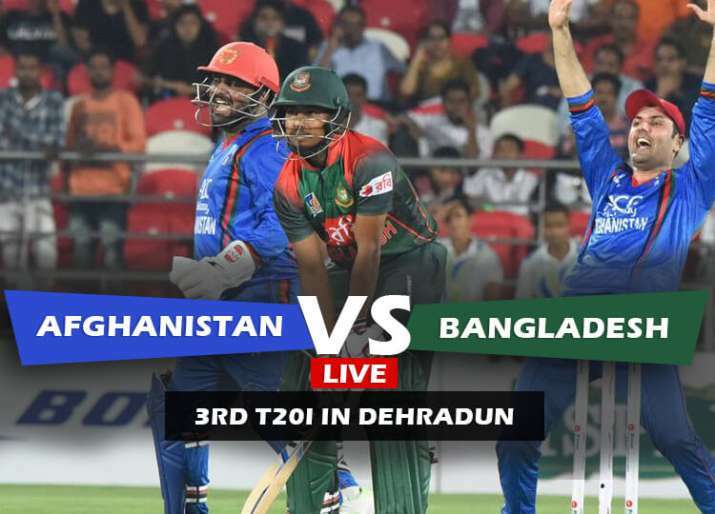 Bangladesh vs Afghanistan, OSN Sports Cricket HD, BAN vs AFG 2018, T20 cricket match live, live cricket match today, live cricket scores, cricket live scores, live match updates, live scores online. Here you can get all the information and details as to when, where and how you can watch the live cricket AFG vs BAN, 2nd T20I match between Afghanistan and Bangladesh in Dehradun. With an aim to do well in their maiden Test against India, Afghanistan cricket team is hosting Bangladesh for a three-match T20 series at the Rajiv Gandhi International Cricket Stadium, Dehradun. The talented Afghanistan side are just two weeks away from their historic Test debut against India at M Chinnaswamy stadium in Bengaluru. When is the 3rd T20I match between Afghanistan and Bangladesh? The 3rd T20I match between Afghanistan and Bangladesh will take place on Tuesday, June 7, 2018. Where is the 3rd T20I match between Afghanistan and Bangladesh? The 3rd T20I match between Afghanistan and Bangladesh will be played at Rajiv Gandhi International Cricket Stadium, Dehradun, Uttarakhand. What time does the 3rd T20I match between Afghanistan and Bangladesh begin? The 3rd T20I match between Afghanistan and Bangladesh begins at 8:00 PM IST. The toss will take place at 7:30 PM IST. How do I watch the online live streaming of 3rd T20I match between Afghanistan and Bangladesh? AFG vs BAN live streaming: The Live Streaming of 3rd T20I between Afghanistan and Bangladesh will not be available on Hotstar. You can catch live scores, live updates and live commentary on www.indiatvnews.com. What are the squads of 3rd T20I match between Afghanistan and Bangladesh?